Tom is a property partner specialising in residential and agricultural property. Tom acts for UK and foreign clients in relation to the acquisition or disposal of residential and agricultural property, landlord and tenant matters including leasehold enfranchisement, lease extensions, mortgages and finance. He works very closely with the onshore and international tax teams in particular, and his overriding aim is to provide a joined up integrated service to the private client. Tom is recognised as a “Band 1” lawyer in Chambers HNW and as a “Leading Individual” in Legal 500. 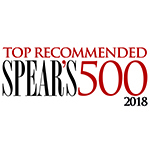 He is also top recommended in the Spear’s 500 guide. Chambers says that Tom is “highly regarded by property agents, with one noting that "he's intelligent, he gives good advice, he's calm under pressure and he's a very solid pair of hands." Thomas is admitted to practise in England and Wales. "He is an intellectual but also very user-friendly. He is an exceptional man"
“A key partner”, who is “calm and knowledgeable and understands the importance of being thorough, while acting quickly, with the end objective always in mind”.